Back L-R: Elder Petersen, Elder Wafula, Elder Torrie, Elder ______, Elder Ford, Elder Rasmussen, Elder Lyman, _____, ______, _________, President Msane, Elder Manu, Elder Pavik, Elder ______, Elder Hales, Elder Emmanuel, Elder _)_____, Elder Limu, Elder Kiio, Elder Arudo, ______, __________. Middle L-R: Sister Petersen, Sister Torrie, Sister Ford, Sister Lyman, Sister _______, Sister Msane, Sister _______, Sister Alinyo, Sister Were, Sister _____, Sister Kiio, Sister ___________. Front L-R: Elder Musonda, Elder Mwashi, Elder Kiio, Elder _________, Elder Mwaja, Elder Chenani, Elder Lotulelei, Elder ________, Elder ________. Our first Zone Conference! It was great. A zone is an area covering several "districts" and "districts" have several companionships of missionaries. 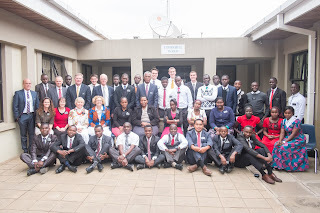 There are 16 companionships in the Nairobi Zone (so 32 but actually 33 missionaries since one companionship has three missionaries). Then when you count the 4 senior missionary couples (including us), that's 41 missionaries plus the President and his wife. At a Zone Conference, which is held once a quarter, we receive instruction from the Mission President and his wife and from the Assistants to the President. The theme of our conference was "Obedience is a Choice." Elder L. Tom Perry, of the Quorum of the 12 Apostles said that obedience "is a choice between our own limited knowledge and power and God's unlimited wisdom and omnipotence." Elder Boyd K. Packer, another of our Apostles (who recently passed away), said, "Obedience is powerful, spiritual medicine. It comes close to being a cure-all." I like that. So important to obey. With obedience comes safety and a multitude of blessings. Another thing from Zone Conference: "We teach people, not lessons." And another: When we are asked to do something by the brethren (who speak for the Lord), we should ACT and not just ask WHY. Then, as we act, the answers to the "why" will come from the Lord to us individually or from the brethren who speak for the Lord. It's actually quite simple. Fun to help Sis Msane feed all those hungry missionaries! No one wanted to leave after the conference. Fun to be together. Here they're helping carry things from the kitchen to the vehicles. Back L-R: Elder Lotulelei, Elder Hales, Elder Pavik, Elder Rasmussen, Elder Arudo, Elder ______. Front L-R: Elder Mwashi, Elder ______, Elder Emmanuel. Fun missionaries -- black and white. And by the way, it's politically correct to say Black Africans and White Africans and then of course there are the Mzungus (the white foreigners). Back L-R: Elder Hales with Elder Mwashi in front, Elder Musonda, Elder _____, Elder Emmanuel, Elder ________. Front: Elder Odundo. Everyone likes to get in on the fun. Back L-R: Elder Hales, Elder Pavik, Elder Rasmussen. Front L-R: Elder Mwaja, Elder Mwashi, Elder Musonda, Elder ______, Elder Emmanuel. 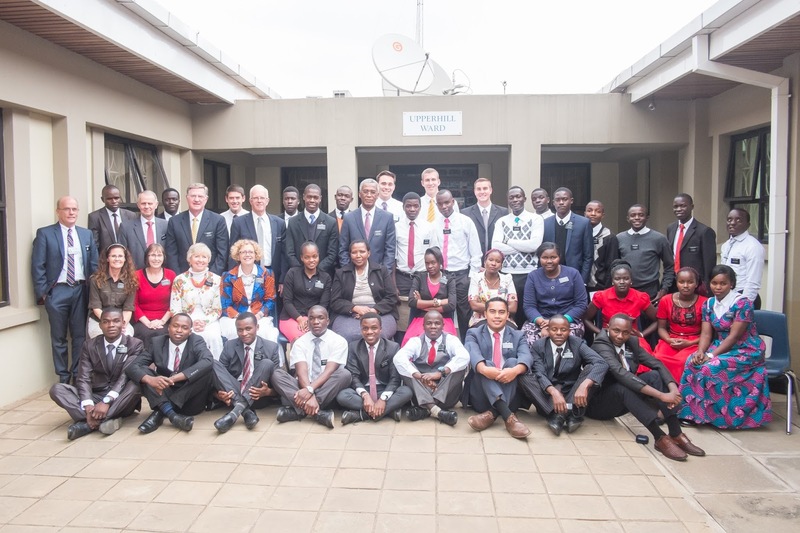 Four of the five American missionaries in the Nairobi Zone: Elder Lotulelei, Elder Hales, Elder Rasmussen, Elder Pavik. Just missing Elder Manu (who is also very tall). He must have already left. Elder Chenani with Elder Torrie and me. It's fun to meet the missionaries after weeks of getting their documents ready prior to their arrival in the mission. I always get to see their photos and then it's interesting to actually see them in person. Elder Chenani was one of 14 new missionaries who arrived in June. He's doing great! Wow, that elder is SO TALL! And it's interesting to see the building materials (construction). Wow.